March 19, 2019 — Our Post-Release Monitoring (PRM) team from Camp Lesik, in the Kehje Sewen Forest, recently spotted Teresa and her baby roaming across a hillside near Camp Lesik. When we released a story about Teresa’s newborn last year, her baby had yet to be named. Our team conducted many hours of observation before finally being able to determine that Teresa’s baby was male. He was eventually given the name Berani, meaning ‘brave’ in Indonesian, through a naming contest organised by BOS Germany. 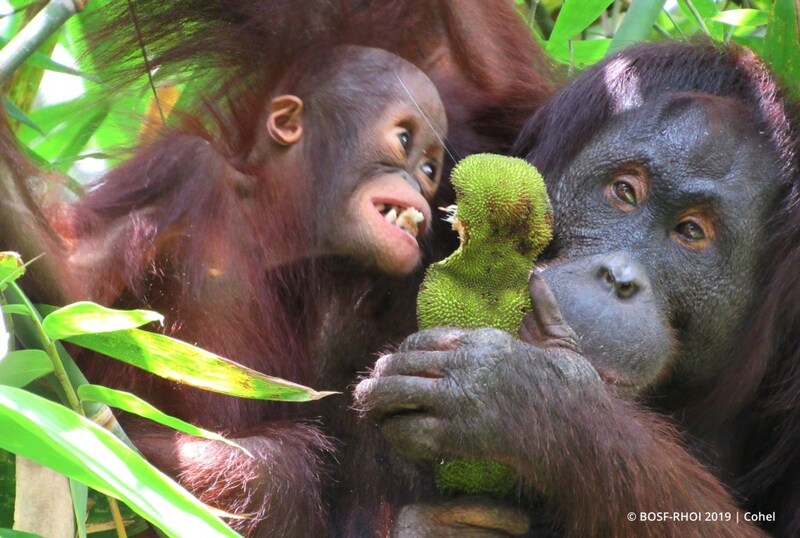 Our PRM team members were unable to locate Teresa and Berani for several weeks, but eventually found the mother-infant pair enjoying forest fruits together on a hillside. Both appeared to be in good health, and were actively moving through the forest. Berani had also grown bigger! 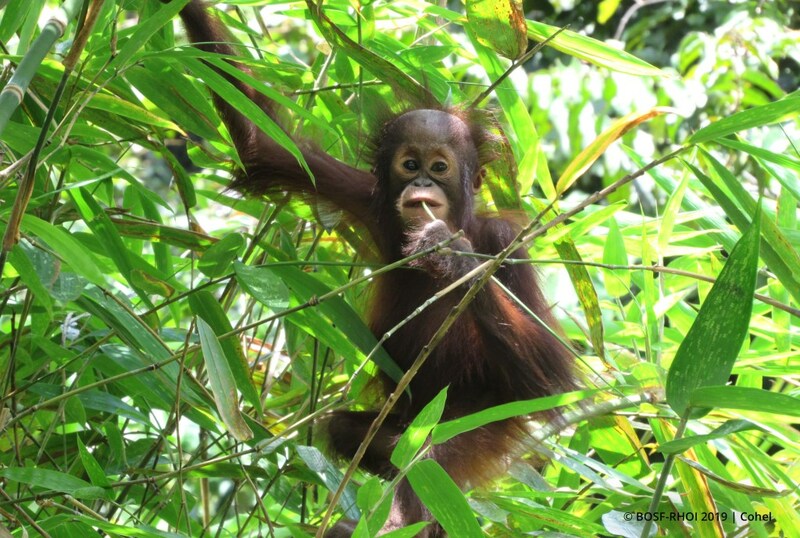 During observations, Berani showed great progress and was seen foraging away from his mother. He was often fed by mother Teresa, but also picked young bamboo leaves on his own and sucked on the juice inside. Living up to his name, he bravely moved on his own from tree to tree and explored the forest while Teresa monitored from a safe distance. 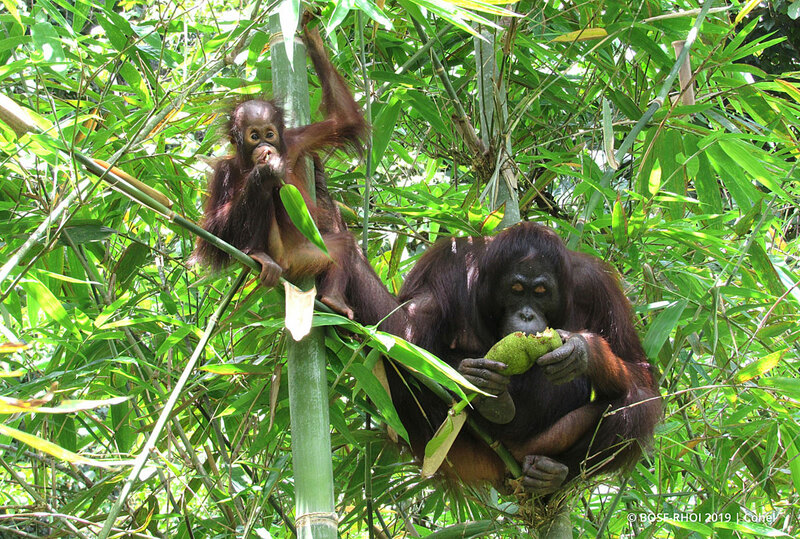 By the late afternoon, the pair had returned to the heart of the Kehje Sewen Forest. Our PRM team is delighted to have finally caught up with Teresa and Berani, and to report that both mother and son are thriving in the forest! We are confident that Berani, under the loving care and guidance of his mother, will grow into an independent orangutan capable of facing the challenges of life in the wild. Stay healthy and keep living the good life, Teresa and Berani!